The bathroom was considered to be a very important room of the house. It was often very large and contained more than just the basic bathroom fixtures. You might see a glamorous dressing/make-up table with a huge mirrored wall as the backdrop. Or you might find a sumptuous chaise lounge with an exotic zebra-print rug underneath. 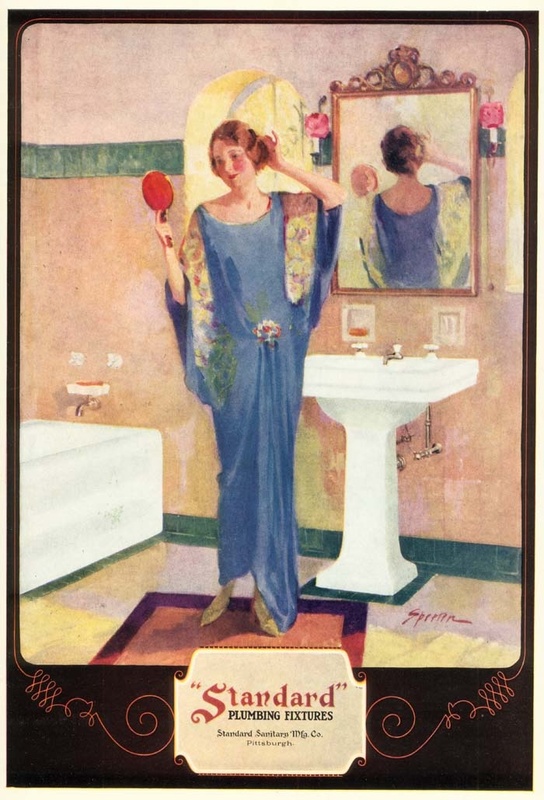 The bathroom was the domain of the silver-screen goddess and domestic goddess alike. This was where a woman could get away from it all, pamper herself and feel her most glamorous. Beauty and decoration were highly respected during the days of Deco and the bathroom had to contain these elements as well. Top-quality marble was the primary choice for floors. Brightly coloured vitrolite was used to tile the walls. Bathtubs were encased in sparkly, iridescent glass tiles or even mirror. Vanities and storage cabinets were often mirrored as well. 'Skyscraper' sconces framed mirrors on either side. Sparkling glass and crystal chandeliers completed the ultra-ritzy look. Shiny, stainless steel or chrome faucets were common. Floor tiles were patterned with typical Art Deco geometric shapes like zig-zags, chevrons, sunbursts and hexagons. Taps were typically angular as well, often with a whimsical shape. Faucets were tall, vertical and sharply angled. Sink pedestals were very angular and typically designed in a 'v-shape' or a staggerd/tiered look. Sink basins were in the shape of large squares or rectangles. Mirrors were embellished with mosaic tiles laid out in geometric patterns. Area rugs or bath mats had angular designs woven throughout. Art Deco sinks, toilets and bathtubs were usually brightly coloured: salmon, green, yellow and even black were popular colour choices. 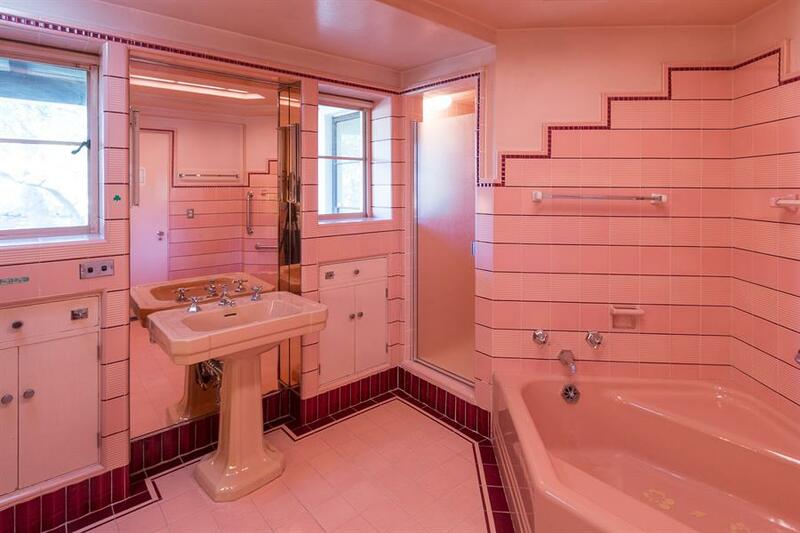 Tiles and accessories were brightly coloured as well to complement the plumbing fixtures. 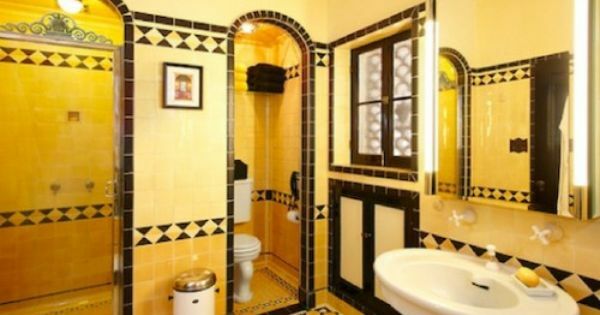 Another typical Art Deco colour scheme was black and white.